Alien: Blackout all but confirmed for a Game Awards reveal, and... Kojima might be involved? A previously rumoured new Alien game, Alien Blackout, might well be getting a reveal at this year's Game Awards if a few cryptic tweets are to be believed. The current theory is that this is a teaser for Alien: Blackout, rumoured to be the next game in the franchise. The 'W' and 'worlds will change' recalls the movie's bogyman company Weyland-Yutani, and it's 'building better worlds' tagline. The 80's style computer screen on the other hand seems to be in the style of Creative Assembly's excellent Alien: Isolation. Of course, it's probably just coincidence. 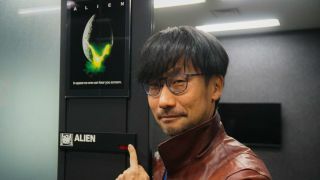 Kojima loves movies (he may have mentioned it) and this could just be him taking a chance to visit the studio. Plus I've no idea of the relation between the film and game divisions. The link between the tweets could just be timing, although both Kojima and the Game Awards must know what people are going to think. However, it's unlikely the new game will be anything to do with Kojima Productions as Fox bought Cold Iron Studios in January specifically to work on a new Alien shooter. Maybe Hideo Kojima could be consulting? Or filming something to introduce the new game at the show? When Fox acquired Cold Iron it was to "explore areas of the universe that fans haven't got to experience". At the time Aaron Loeb, president of FoxNext Games, mentioned that the studio was working to "create an action-packed persistent world, steeped in the mysteries of this beloved Alien universe". That has a whiff of Destiny 2 or even Fallout 76 which could be super interesting. We'll find out for sure about Alien: Blackout when the Game Awards airs on December 7. In the meantime If you want some more Kojima then check out all the weird connections between Death Stranding and Silent Hills.